Many marine species can be difficult to study, as they remain hidden from the human eye during significant components of their life cycle. Behavioral studies in particular have thus been heavily skewed toward organisms that we can observe for long periods of time, often in the captive environment. For instance, interest in social behavior in insects, communication in songbirds, and higher cognitive abilities in mammalian species has been well-documented. However, the evolution of radio, sonar, and geographic information systems (such as GPS) has led to a new type of scientific technology, one that has allowed us to examine a significant component of behavior: movement. What’s more, this technology is waterproof. The term “telemetry” refers the use of an electrical apparatus to measure a data point (often speed, temperature or pressure) and transmit the result. “Biotelemetry” applies this practice to organisms. As scientists discovered its use in gathering more comprehensive data on animals, biotelemetry technology has come to take a variety of forms. Generally speaking, however, the basics of each method are the same. First, an instrument known as a “tag” is attached to or surgically inserted into the organism. The tag transmits an electronic signal containing certain information about the animal and its environment. This information depends on the type of tag, and it can consist of velocity, acceleration, temperature, and/or pressure data. The tag remains attached to the organism for a period of time (also dependent on the type of tag) and transmits periodic signals of information as its host resumes normal activity. Another instrument known as a “receiver” acts as the second component to this system. The receiver is designed to retrieve the signal when the tag is within its range. Again, receivers can take a variety of forms. For example, acoustic (ultrasonic) telemetry uses sound waves to transmit information. These waves are beyond the range of human hearing. In the process of passive tracking, a system of stationary receivers is installed throughout key habitats. These receivers can determine the presence or absence of tagged animals that travel throughout the habitat, based on the signals they can detect. Conversely, active tracking consists of a single mobile receiver. In this case, the scientists are in control of the receiver, which allows them to follow the path of the animal based on where the tag signal is the strongest. In marine ecosystems, arrays of receivers are installed or anchored to the ocean floor or sunken structures (even bridges) for passive tracking. For active tracking, a receiver is often lowered from the side of a vessel. In addition to ultrasonic telemetry technology, satellite tags can provide more long-term data. In the underwater environment, the tags activate to transmit information only when the organism is at the surface. In this case, the receiver is a satellite system orbiting the earth. The information is then processed by the satellite and transmitted again to a data-processing system on land. Archival tags simply store the information while the tag is attached to the organism. In many cases, they release after a certain period of time to be collected for data retrieval. Radio tags transmit signals at the same frequencies as those used by the modern radio. To choose among all of these systems, it is necessary to have a basic understanding of the environment in which they will be used. Though they may seem interchangeable, each will provide slightly different information. Scientists must therefore consider both their research question and the organism to which it will apply. If we want to examine long-distance migration, perhaps a satellite tag with a better battery life would be better. On the other hand, if we want to look at fine-scale movement, active acoustic tracking can show us how an organism moves over a few hours or days. If the animal is small, such as a bird, a lightweight tag should be used, perhaps in a backpack. 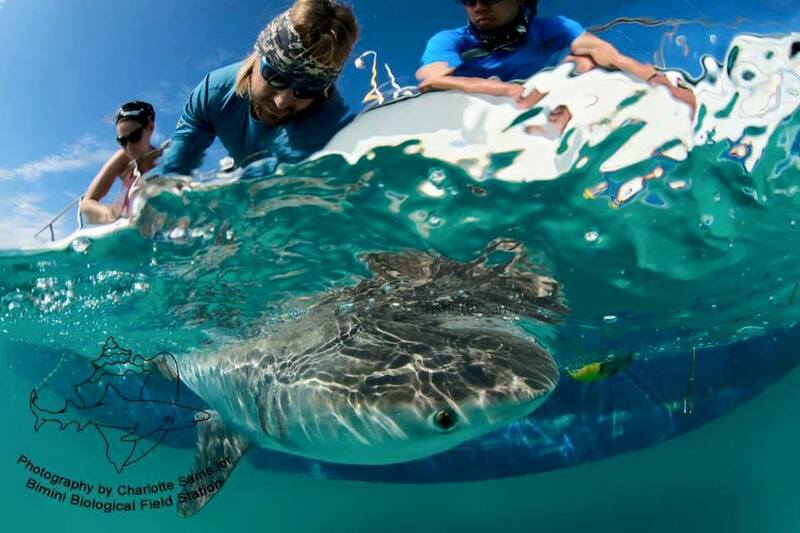 Yet we can take advantage of the large size of many shark species to insert tags with heftier batteries, which will allow us to study their movements over longer periods of time. Since its inception in the late twentieth century, biotelemetry has become central to movement ecology, particularly underwater. It has produced key results on feeding, migration, and even mating behavior on species that were formerly impossible to study. As the technology continues to grow, tags have become smaller and yet more powerful - some are only a few centimeters long and can be safely attached to fragile juveniles. In turn, the advancement of biotelemetry has inspired more advanced scientific questions and endeavors. It has opened a gateway to our understanding of our world’s oceans.